Smyths is originally an Irish company, founded in County Kilkenny. Smyths Toy Superstores now have over 100 stores in the UK and continue to expand. Smyths is already the biggest toy store in Ireland. You can find your nearest UK store by clicking here. Where can I check my Smyths Toys gift card balance? You can check your balance in-store at any till by handing the card to a member of staff. Where can I spend my Smyth’s gift card? The card is welcome at any Smyths Toy store in the United Kingdom. Cards sold in the UK in sterling cannot be used in the stores in the Republic of Ireland, and vice versa; cards sold in Euros in the Republic of Ireland cannot be spent in the UK stores. 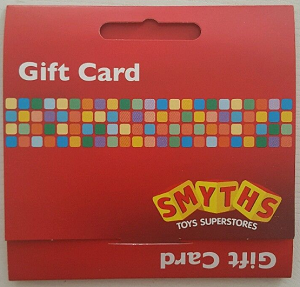 The gift card is now welcome online at the Smyths Toys Website.